The actor and cabaret artist Karl Farkas was born in 1893 in Vienna. To his relatives belong the uncle Felix Salten who became famous as a screenwriter and author (among others "Bambi" and "Josephine Mutzenbacher"). Karl Farkas was desirous to become an actor at a young age but his parnts were insistent that he will become a lawyer. His brother wanted to become a painter but the parents were insistent as well that he should take over the shoe store family business. Karl Farkas brother gave way to despair that he committed suicide. The parents were so shocked that they granted Karl Farkas' wish to become an actor. But before Karl Farkas could launch his artistic career he served during World War I and was wounded. After the war he studied music and fine arts at the academy in Vienna and afterwards he gained a foothold at the theater. It followed engagements at different theaters in Austria and in 1921 he was engaged at the cabaret Simpl where he appeared together with Fritz Grünbaum. With it he established his popularity as a cabaret artist. 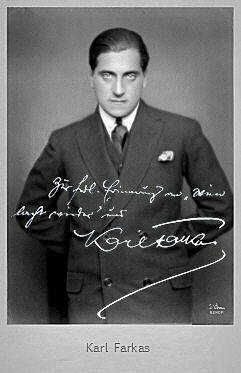 From 1926 he appeared at the legenday Burgtheater as well. He made his film debut as an actor during the silent movie era and the took part in "Namenlos" (23). After a longer interruption he continued his film career in the 30s with "Lumpenkavaliere" (32) and "Der grosse Trick" (33), beside it he also wrote first screenplays to the productions "Wenn die Soldaten..." (31), "Mein Name ist Lampe" (32), "Madame hat Besuch" (32), "Abenteuer im Lido" (33) and "Salto in die Seligkeit" (34). Because of his Jewis ancestry he was not able to work in the National Socialist Germany and from 1938 also no longer in Austria. He emigrated via Paris to the USA where he continued his artistic career in a smaller scope by performing in front of other persons living in exile. In the film business he only collaborated at the screenply for "Boogie-Woogie Dream" (44). When Karl Farkas emigrated he dissolved his marriage with the actress Anny Han who he already got married in 1924. So he avoided that she was compromised because of her marriage with a Jew. Karl Farkas returned to Austria after the war and got married with Anny Han again. He continued his former career seamlessly and he became very popular as a cabaret artist again (among others at the cabaret Simpl again). Especially his performances together with Ernst Waldbrunn and Maxi Böhm were very successful. He also appeared again in front of the camera, among others "Rosen der Liebe" (49), "Stolen Identity" (53), "Charleys Tante" (63), "Bilanz der Saison" (69) and the serial "G'schichten aus Wien: Vom Cabaret bis ABC" (70). To his postwar screenplays belong "Fregola" (48), "Der Theodor im Fussballtor" (50), "Schäm' dich, Brigitte!" (52), "...und wer küsst mich?" (56), "Augst der Halbstarke" (57), "Familie Schimek" (57), "Im schwarzen Rössl" (61) and "Heiter bis wolkig" (69). Besides his activity as an actor and screenwriter Karl Farkas also wrote some lyrics. The most popular lyric is certainly "Wenn die Elisabeth nicht so schöne Beine hätt'...".